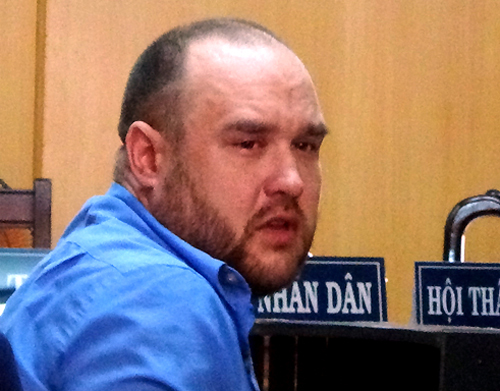 A HCMC court sentenced a South African to death on Tuesday for smuggling 1.5 kg of cocaine into the country. According to the police report, customs officers at the Tan Son Nhat Airport discovered two bags of cocaine in Coetzee Tyron Lee’s carry-on luggage in June 2016. Lee had come into Saigon from Dubai. The drug is believed to have come from Brazil, but the flight transited in Dubai before proceeding to Saigon, Phap Luat newspaper reported. Coetzee Tyron Lee is seen in a file photo by VnExpress. Coetzee confessed that he was promised $3,500 by a Nigerian residing in South Africa to make this shipment. Vietnam is a key trafficking hub for narcotics around the Golden Triangle, an intersection of China, Laos, Thailand, and Myanmar and the world's second largest drug producing region. However, judging by news reports, there is no sign that tough laws and the regular awarding of death sentences has proved to be a deterrent for drug trafficking, which has continued to increase every year.